Standing at 6"10, Brock is a Power Forward-Centre originally from Brisbane. In 2009, he moved to the United States to play college basketball for the Washington State Cougars. In his four-year career, Motum scored 1,530 points (12.8 per game) and left WSU fifth on the school's all-time scoring list. After his college career Brock went on to play in the Lega Basket Serie in Italy. He has also experienced the NBA with summer league exposure at the Philadelphia 76ers and Utah Jazz. 2015 saw Motum join the Euroleague through Lithuanian powerhouse Basketball Club Žalgiris, along with being a part of the Al Ramsay Shield winning Boomers, in the 2015 FIBA Oceania Championship. Motum realised his dream of becoming an Olympian at the 2016 Rio Olympics, helping the Boomers reach the Bronze medal match, eventually losing in heart-breaking fashion to Spain. During Motum's second season with Žalgiris he helped lead his team to the LKL Championship while also playing a vital role in the EuroLeague, registering 10.5 points and 9.5 rebounds per game. 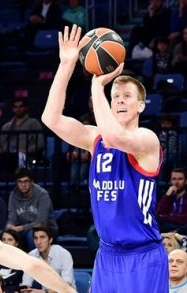 In June 2017, Motum signed a one-year deal with Turkish club Anadolu Efes.